Home » Cooking » Krista’s Geeky Pies for Pi Day 2018! 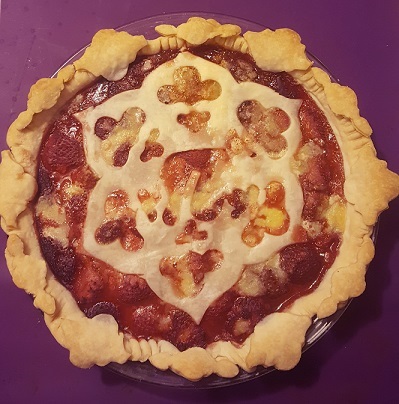 Krista’s Geeky Pies for Pi Day 2018! Written by: KristaG on March 14, 2018. I’m making homemade pies for Pi Day 2018! 3.141159265359…etc. Look familiar? It’s Pi (π)! 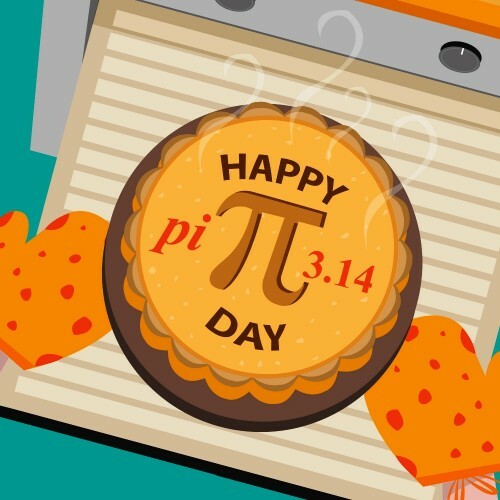 Today also happens to be March 14th and, due to it’s resemblance to the numerical representation to Pi, is likewise known as Pi Day! Over the years, I have tried to do quite a few different and fun things for Pi Day including pizzas, Irish hand pies, pie pops, and even dip-able pie crust “fries”! This year, however, I’ve decided I really want to stick to making classic pies and, with a little help from my Kickstarter rewards from Pies Are Awesome, I will be modding them for a bit of a geek twist! Due to the weather finally starting to warm up, I wanted to celebrate with some flavors that are light and refreshing versus heavy and filling so I’m making 2 of my favorite recipes for Spring: a Rhubarb Custard Pie and an extra-tart Key Lime Pie! Jessica Leigh Clark-Bojin’s new book: Pie Modding! Jessica Leigh Clark-Bojin (a.k.a. @thePieous), launched her Pies Are Awesome Pie Guides on October 26, 2016, on Kickstarter.com where the campaign not only funded during the first day but reached all of the initial stretch goals within just 4 days out of the 30+ day campaign! 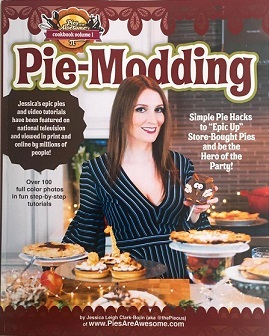 Since then, she has published a “Pie-Modding” book for both bakers and non to demonstrate how literally anyone can decorate a pie and make it “epic.” For a limited time, her book comes with a free pie guide (stencil) if purchased from her website. I, being the geeky hostess and baker that I am, went all in for her collection of Pie Guides and additional Powder Guides and have been dying for an excuse to try them out since they arrived at my house last summer! Using the Pi Mandala Pie Guide stencil, I got to create a very unique and stunning pie! Arrange rhubarb in unbaked pastry shell. Blend sugar and flour; add egg yolks and lemon juice, and stir until thick paste is formed. Pour this mixture over rhubarb. Bake in a hot oven (400 degrees) for 20 minutes; then reduce temperature to 350 degrees for 20 minutes. Allow to cool before serving. Serve plain, with a meringue of 2 egg whites, or with whipped cream. When modding this pie, I wanted to use one of my Pie Guides since I used a standard pie crust for the pie itself. As this pie is typically made as a single-crust pie (meaning it does not have a top-crust), I decided to stick with that and simply cut out the designs to be placed on top. For the design, I used the Pi Mandala since it the day is literally all about Pi! I found using the guide to be surprisingly easy. My favorite thing about it is probably the fact that none of the designs are actually set in stone so to speak, but leave users with a lot of freedom to create their own designs and mix and match pieces however they desire. I had a lot of fun playing around with the edges and letting my creativity run free! A Key Lime Math Butterfly! If you look super closely, you can see various mathematical symbols from various branches of Math including Calculus, Geometry, Algebra, and even basic arithmetic! Lightly spray at 9” pie pan with cooking spray. Crumble the crackers into a food processor or blender and pulverize into a fine, even crumb. Measure out 1 ½ cup of crumbs. Stir together the crumbs, sugar, and the butter in a small bowl. Use the bottom of a glass or a similar flat surface to press the crumbs down into a compact layer in the prepared pan, covering the bottom and sides of the pan (I used an old metal pie tin from a previously purchased pie crust and it worked really well). Bake the crust for 5 minutes. Remove the pie pan from the oven and allow the crust to cool while preparing the filling. Combine the condensed milk, lime zest, lime juice, and egg yolks and blend them together. Pour the filling into the prepared crust and bake until the filling is set, about 15 minutes. Remove pie from oven and allow to cool for a ½ hour to room temperature before cooling completely in the fridge for at least 2 hours. Since my Key Lime Pie uses a homemade graham cracker crust, I wanted to try something a little different with the Powder Guides when decorating this pie – using extremely fine crushed graham crackers instead of cinnamon or powdered sugar! To get them to be powder-like, I put them in the food processor until I couldn’t get them any smaller. I did a few test runs and was a little concerned about what the final results would be, but after playing around with it, I think I got it to work okay. The Powder Guides are definitely a little harder to work with than the cut guides (getting things to line up just right doesn’t always work out even if you try hard not to shift it), but most mistakes are usually fairly easy to recover from. To make it a little easier, I used a disposable pastry bag so I could control the flow and the location of where my crumbs were going to end up. 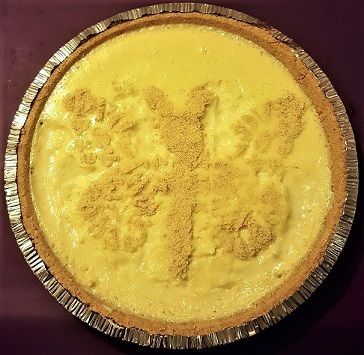 For the design, I chose to use the Math Butterfly Powder Guide to stick with the Math theme of the day but modified it some since I wasn’t going to be cutting any extra pie crust decorations out. Overall, I’d say it came out okay but is something I will want to play around with more for next time – especially since the design is a little harder to see unless you’re able to get close to it. Also, you definitely want to make sure your pie has cooled completely before messing around with the Powder Guide! I found this out the hard way, but was able to rescue my design and the pie!